Romantic Industrial Wedding Inspiration. 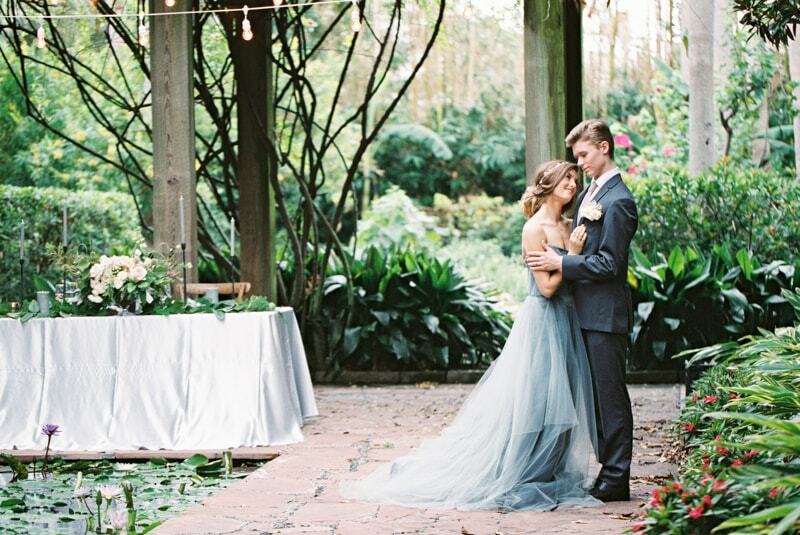 This styled shoot spotlights the beauty of a romantic, urban and industrial oasis in the heart of Houston, Texas. At 5226 Elm, the peaceful garden setting is tucked away by modern architecture but it’s the lush, enclosed greenery that brings together several unique and inventive touches. 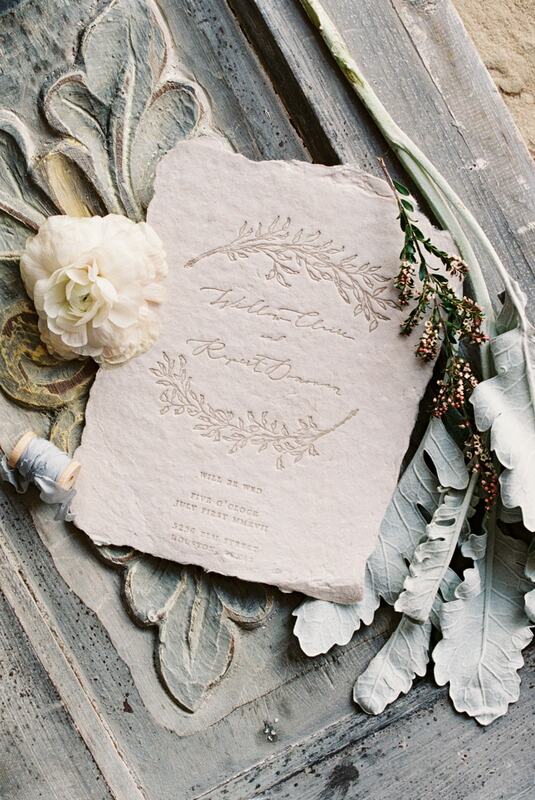 The details of this styled shoot are incredibly impactful, including the invitation suite. A standout piece includes an embossed invitation that is delicate and simple – perfectly capturing the essence of the event. The bride’s incredible jewelry collection is colorful, vibrant and classic. 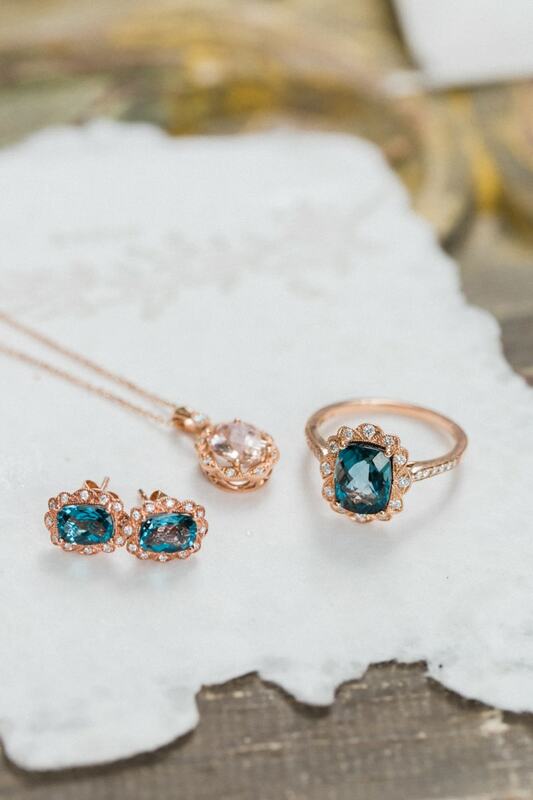 The striking color of the gemstones is just a preview of the bridal look to come. 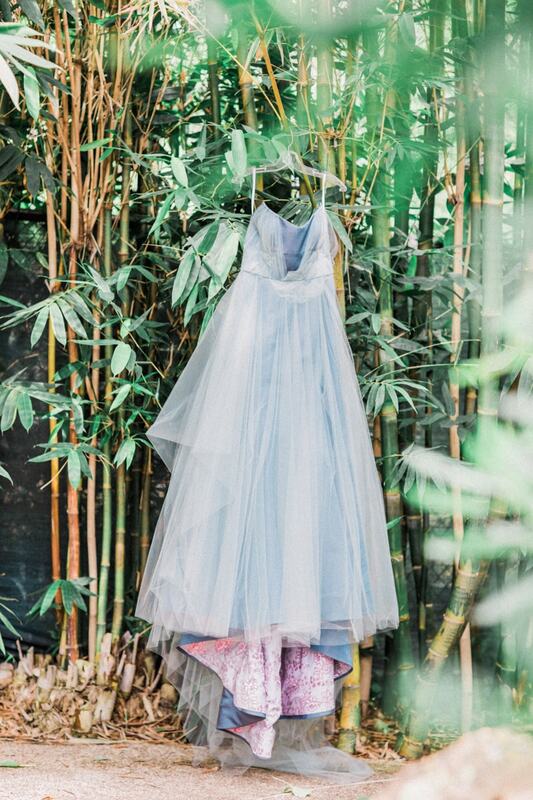 Her gown is on full display next to the garden’s colossal bamboo. Her strapless blue tulle creation is whimsical and youthful. Her look is complete with dramatic eyes, a dark lip and low, wispy updo that’s accessorized with a beaded headband. A pair of sparkling heels is the last piece to her stylish puzzle. She clutches a loose, oversized bouquet that’s as interesting as it is lovely. A collection of blooming blush roses rests within a bed of hearty greenery. The groom doesn’t miss out on the chance to accessorize, too. Here, he shows off a classic watch as he fastens his cuff link. 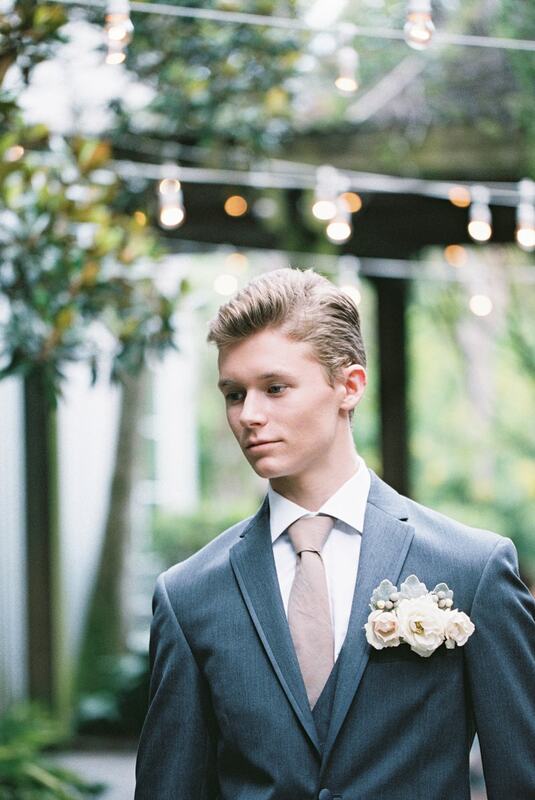 A dark gray tuxedo, blush pink tie and stylish pocket square is a handsome combination for this enclosed event. 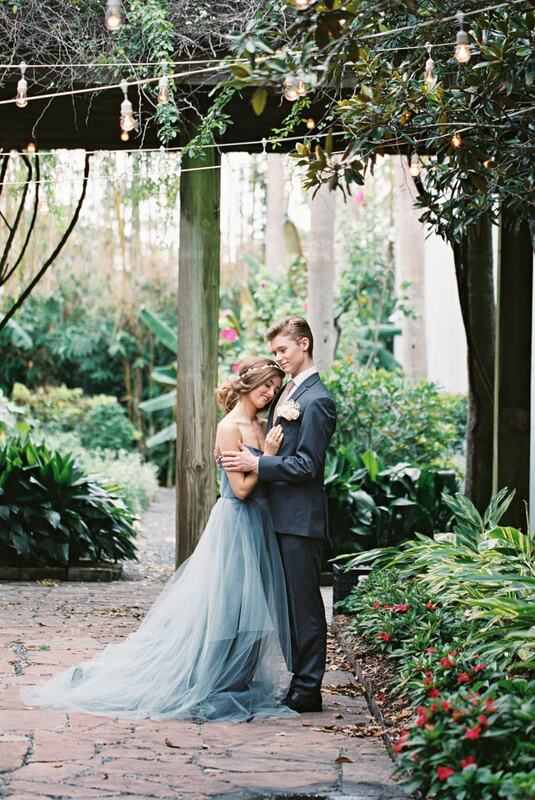 The youthful couple stand beneath the venue’s string lights, surrounded by 5226 Elm’s lush garden and terra cotta pathway. Place cards feature romantic script and floral accents. Berries, figs, dusty miller and spools of ribbon create an artistic display. The reception table finds a lovely balance between classic romance and modern industrial styles. While the glassware, candleholders, china and copper mugs are more modern trends, the white linen and plush centerpieces infuse timeless touches. The table is set right in front of the venue’s koi-stocked meditation pool for the perfect vantage point. A sweet conclusion to this peaceful event includes a hexagonal cake that features three pristine white tiers and vibrant sugared berries for a pop of color. 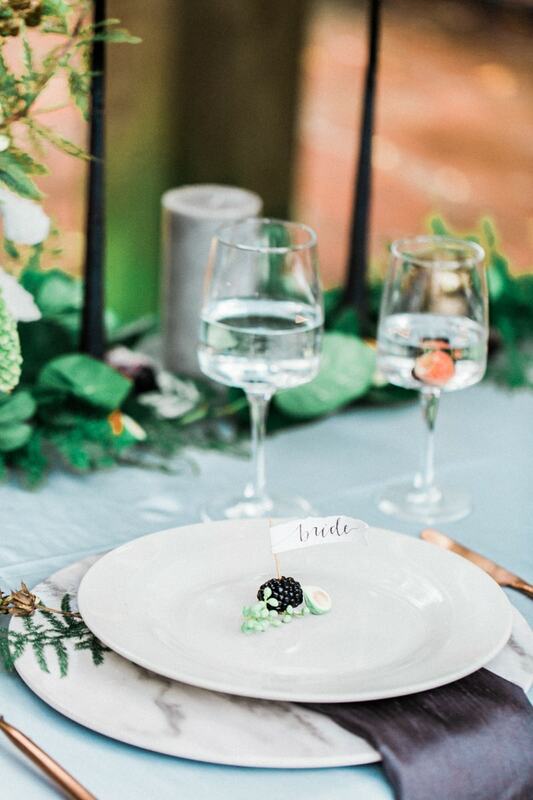 Even in the middle of a bustling city, everything about this styled shoot is peaceful, serene and inviting. No matter the location of your venue or the style of your wedding, tune out the noise and find your own hidden oasis.